Shloshim (the 30-day milestone in the Jewish mourning tradition) is now over for the victims of the massacre of Jews in a Pittsburgh synagogue. In the past few weeks, members of The Third Narrative online community have indicated some diversity in how we assess the state of American Jewry and antisemitism. I am more than willing to stipulate that Sarsour has no personal animus against Jews, and that she finds some expressions of anti-Semitism distasteful. Ultimately, however, she consistently dismisses anti-Semitism as an actual problem, regarding it more as an inconvenience for her and her movement, and dismissing objections to anti-Semitism as a right-wing distraction. This is more than evident in a long letter that she recently distributed to friends and supporters, and which was posted, with her permission, on Rabbi Arthur Waskow’s website. Sarsour’s letter begins by blaming the messengers, and making sure everyone knows they are Jewish: “Jake Tapper and Jonathan Greenblatt of the ADL ‘exposed/ promoted’ a video of the Minister Farrakhan at an annual gathering for the Nation of Islam called Saviour’s Day.” What difference does it make that the ADL exposed the video of Farrakhan defaming Jews? Isn’t that the job of the Anti-Defamation League? . . .
Next, we get “A white supremacist walked into a synagogue and killed 11 innocent people and the focus became the Minister Farrakhan and the NOI.” Uh, no. The overwhelming focus was on the white supremacist background of the shooter, although some people (me included) pointed out that anti-Semitism crosses political lines and exists in other communities. Someone who actually understood anti-Semitism would grasp the connection, as Sarsour evidently does not. Neither Farrakhan nor Robert Bowers (the Pittsburgh murderer) invented anti-Semitism; their anti-Jewish comments are almost identical and they share ancient sources. The commonality of the hatred deserves and requires attention. Then it gets worse, as Sarsour shifts into victim blaming, as she continues that the alleged focus on Farrkhan “is a feature of white supremacy.” So the critics of Farrakhan’s anti-Semitism are now lumped in with white supremacists. . . . Politically speaking, she’s clearly not a friend of the Jewish community, but she’s trying NOT to be our enemy. I give her some credit for that — but not a lot. 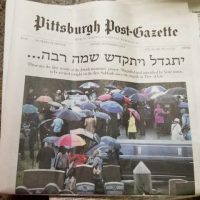 What struck me most about the massacre – apart from the unwelcome fact that it took place at all – was the apparently universal condemnation it received along with the widespread support for the Pittsburgh Jewish community it engendered, notably from Muslim groups. While I have no doubt at all that Donald Trump’s dog-whistles and outrageous comments (e.g., “very fine people on both sides”) have emboldened and encouraged people like Robert Bowers and his ilk, I am particularly intrigued how unlike the current reaction is to most other times in Jewish history, when powerful people and organizations were arrayed, covertly or overtly, against Jews, and antisemitism was open and unconcealed.